Bill Cohn, Trinity College Visiting Professor of History and American Studies, will mark the 100th anniversary of The Great War 1914-1918 (World War I) and the 70th anniversary of the end of World War II (1945) with a discussion of the propaganda techniques used in each war that regimented the public mind. 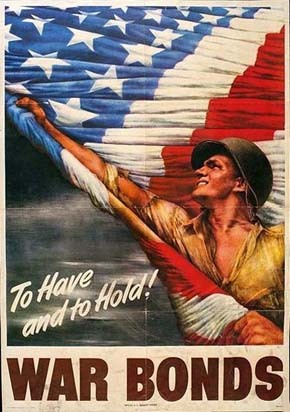 During World War I posters, magazines, government and private organizations played a significant role in mobilizing the nation to enlist in the war effort and to support President Wilson’s goal of making the world safe for democracy. “Americanization” in the face of “the enemy within” became a major rallying cry. Fear of so-called “hyphenated” Americans escalated even before the United States entered the war in 1917. For Americans the fight against evil totalitarianism until unconditional surrender was the theme of World War II and the primary explanation of the war’s cause. Most Americans, at least for the duration, patriotically put aside their individual desires and pitched in for the common cause. The patriotism that united the nation during wartime continued to be a prominent cultural factor in the decades that followed because of the importance of patriotism’s link to the American Way of Life.